Welcome to Canasis Euchre. At the center of fun™ for euchre. Download here. Euchre from Canasis is an online-offline euchre game. A family classic enhanced by adjustable rules and large easy to see cards. Challenging yet easy to learn. Options for Euchre? : Of course, thousands of rule variations/styles! Do I have to join anything? : No! Fastest way to learn? : Always click on "?" buttons to label the screen. Is it like Yahoo? : Lobby is similar, using mouse and creating tables are different. A quick chart to help you with the many styles of euchre we have. Remember, you can customize the rules to your needs. In most types of normal euchre (excluding many types of "bid euchre"), you do not get points for how many tricks you score, you get points for meeting the minimums or achieving certain goals. Here is a simple chart for newbies to use as reference. For some styles of euchre scoring changes. Most notably, super-euchred scoring only applies if that option is turned on. For playing without partnerships, the "with partner" points are used, not the alone points. The below features are on our euchre todo list but we do not know for sure if or when they will be finished. Got any suggestions? Email us. We like to hear from you. There are several ways to help us get euchre going: email, chat, talk, or whatever else you prefer. 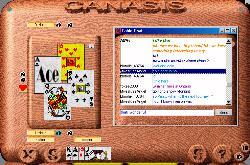 We can always use assistance in helping new players learn to play Canasis Euchre. The more players we get, the better Euchre can become and the more features we add. The biggest thing we need assistance in is getting more players over here. If you are part of a Yahoo euchre club, feel free to represent your club in Canasis Euchre by helping others in your club out and passing on their comments and suggestions to us. If you do this, please do let us know so we can give you credit for it and when it comes time to setup our own clubs we will know who to contact.